What Materials Will Absorb Oil? Whether you are working on cleaning up an oil spill in the garage or cleaning up major oil spills in the world, you need to know what materials can effectively absorb oil. Some items may be found at your local grocery, while some are creations of chemistry. 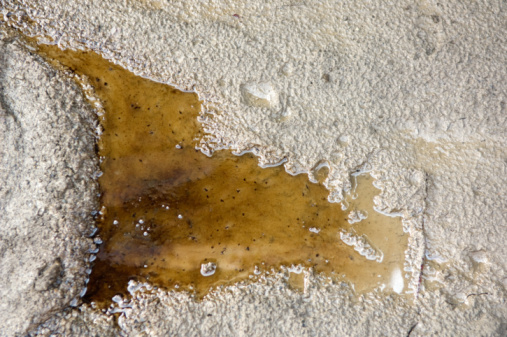 Oil spills can range from simple household spills to major industrial spills. The items at the grocery are effective for small home oil spills, while the chemistry based products are more suitable for major oil spills. Oil spills require specific materials and processes to clean them up. Cat Litter is one of the best-known solutions to absorb oil. Use clean litter and sprinkle it over the spill. Give the litter time to absorb the oil. After it has been absorbed, you can sweep the litter away. You may need to apply a second coating to get all of the oil up. Dispose of the oil like you would any other used oil. Clay cat litter has some absorbency, but if that is not effective, try using a silica-based cat litter. Researchers at the Massachusetts Institute of Technology have developed a nano-wire mesh that looks and feels like paper, and can absorb oil. The material can absorb up to 20 times its weight in oil. The paper is recyclable, allowing it to be a renewable resource for future oil spills. The material functions by absorbing liquids similar to oil from water. The paper is made from potassium manganese oxide. To remove the oil, the paper may be heated to the oil's boiling temperature. The paper and oil can both be used again. A Norwegian Company called ABTEK manufactures an oil-absorbing product made from Reba oil absorbent bark. The product is made from sawdust when certain Norwegian Pine trees are sent to the mill. Its primary purpose is to absorb oil from water. This product is 100% bio-biodegradable. When it breaks down it turns into soil. It has been reported that customers can use the material after it breaks down as nutrient-rich potting soil. A popular solution to home oil stains is powdered laundry detergent. Take the detergent and sprinkle it onto the stain. Pour some water onto the detergent so a paste forms. Scrub the paste against the stain. Afterward, leave it until through the night. The next day add more water to it. Scrub some more and then rinse the solution away.